FIG and Survey Review, through former FIG Vice President Iain Greenway and Richard Grover, have decided to award a paper presented at a FIG Congress/Working Week. The Survey Review prize will be awarded every two years to the author and presenter of a selected paper at a FIG Congress/Working Week. Survey Review is an international journal which has been published since 1931, and in recent years under the auspices of the Commonwealth Association of Surveying and Land Economy (CASLE). It has been published continuously as a quarterly journal, bringing together a wide range of papers on research, theory, practice and management in land and engineering surveying. The paper selected for the prize passes through an initial reviewing and revision stage overseen by FIG, before being judged by members of the Editorial Board of Survey Review. This year’s winner, “Land Valuation in Support of Responsible Land Consolidation on Ghana’s Rural Customary Lands” by Kwabena Asiama, Rohan Bennett, Jaap Zevenbergen and Seth Asiama, deals with an important subject and has implications for many other countries in which customary land rights apply. 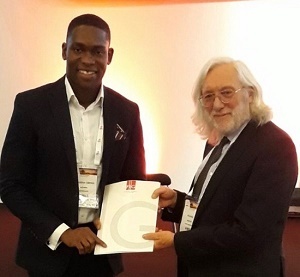 Kwabena Asiama receiving the Survey Review Award from Richard Grover at the FIG Congress in Istanbul. Land valuation is an important aspect of land consolidation where farm parcels are appraised to set a basis for farmland parcel exchange, reallocation, and expansion. There are two approaches to land valuation in land consolidation – the agronomic value, with its basis being the soil productivity and quality, and the market value. The market value has been touted as the better approach with studies pointing out the deficiencies in the agronomic value approach. However, the market value approach cannot be used in Sub-Saharan Africa’s customary lands due to the limited land market. Here, we develop a framework for an approach for assigning values to customary rural farm land parcels that reflects the local people’s view of land value. We found in a case study of Nanton that key land value factors that determine land values relate to the physical attributes, legal conditions, agricultural productivity, locational factors, and the planning scheme of the farmland parcels. These factors were weighted by the local community according to their perception of what affected their choice of farmland parcels. The weights were integrated into the framework the produced the Land Value Index (LVI) for each land parcel in the area of study. Our results showed that in a scenario analysis, a change in weights affected the land value indices at a scale that could change the comparative basis of the land parcels. The sensitivity analysis however showed that the LVIs were not significantly sensitive to the changes in the weight of the factors. However, a prime weakness of this framework is that it is more expensive to use than automatic valuation models. Our results demonstrate that it is possible to place relative quid pro quo values on rural agricultural farmlands that have no land markets. We anticipate that the approach can be the starting point for more approaches to valuing rural customary lands for specific purposes. A further verification is however needed in the study area to ascertain whether the results of the derived LVIs are representative of the local farmers’ view of their land values, and how the framework will fit into land consolidation practices.